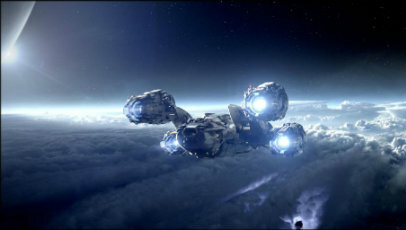 Moved to investigate an alien moon after coming across archaeological evidence of their creators (known here as ‘Engineers’), scientists Elizabeth Shaw (Noomi Rapace) and Charlie Holloway (Logan Marshall-Green), backed by a trillion dollar investment from Peter Weyland, founder of ‘The Corperation’, lead an expedition aboard the ‘Prometheus’. As the team begin to explore the moon it soon becomes clear that all is not as it appears and, along with cryptic figures Meredith Vickers (Charlize Theron) and the android David (Michael Fassbender), both of whom are acting on behalf of Weyland, they discover a threat to humanity as a whole. When presented with a narrative as comprehensive and outlandish as Prometheus’, there needs to be a certain level of trust in the screenwriters, with the hope they have a clear destination and that all the tiny elements that may not work at the time have their place within the overall climax. Unfortunately, in the case of a film that is built upon idea after idea, speculation after speculation, both through the screenwriters’ ambivalence and the characters’ differing beliefs and objectives, Prometheus spends far too much time exploring the ‘what ifs’ than unearthing the narratives exact purpose. The destination for Prometheus may become clear-cut, particularly as screenwriters Jon Spaihts and Damon Lindelof make many hints – predominantly through the Alien series’ mythology – to the place these characters’ story may have in the universe its quite clearly contained within. However, the narrative as a whole is far too ponderous and existential to compensate for the intense level of audience investment it demands. This may not be as irritating for those with an interest in the unanswerable questions the cosmos poses as it is for others, but when presented with a series of never-ending hypotheses that constantly build atop one another without any real sense of intent, it ends up feeling disorganised and all-too slight for its own good. Qualities that have the potential to set Prometheus apart – its strong-willed female characters and ability to touch on a wide variety of issues – are few and far between and are overshadowed by large sections dedicated to characters or, as mentioned above, ideas that don’t offer anything distinctive to a narrative that requires a more centralised core. Also, while being rooted in survival horror, the precarious situations these characters find themselves in fail to extract the necessary reaction of dread that is key to films of its ilk. For a film that’s associated with one of the best sci-fi horrors of our time, Prometheus feels tame in comparison, but then it does seem to opt for an altogether different approach – one that, even in its own right, seems insubstantial in its ability to evoke fear within its fervent audience. As much as the narrative blunders, the visuals too feel underwhelming. It’s not at the fault of Scott, who’s direction suits the statuesque sets of both the moon and the ship itself, but more with the production design and effects departments. Where Scott can evoke immeasurable depth of field from anything he focuses the cameras attention onto, it doesn’t have quite the same impact when the puzzling aliens and creatures that are supposed to be terrorising our heroes’ search for answers look as unrealistic as they do. It’s a real shame since the ragged landscapes are captured so well by cinematographer Dariusz Wolski and and it’s clear that Scott is a master at masking the alien moon feel somewhat akin to that of Earth. It’s in the acting that Prometheus truly delivers, though each and every other performances feels redundant against Fassbender’s exceptional turn as David. His unclear motives and involvement with The Corporation result in some interesting dynamics with other characters. Rapace delivers a performance forever in the shadow of Ripley, and it’s only towards the latter half of the film, when she’s resigned herself to the fact that the expedition’s trajectory hasn’t played out exactly as she’d hoped, that Rapace truly shines in Elizabeth’s acceptance as instigator of what’s to come rather than the discoverer she’s always dreamt of being. Theron does her best with the limited material awarded to her, though her ambiguous nature establishes a rift between her and the audience. Idris Elba and Kate Dickie provide decent support as members of the Prometheus’ crew, but the rest, including an irksome Marshall-Green, are there simply to propel the narrative in whatever way is necessary. A lot can be said for a film that’s epic in scale yet inconsequential in its heart, but even Prometheus doesn’t quite match that description. Yes, it asks some interesting questions, mostly through David’s thirst for knowledge that mirrors our own need for continued scientific discoveries, both old and new, yet there’s a constant concern that what the writers and Scott himself have tried to achieve is more or less a massive disappointment when the film eventually does reach its endpoint. Good review. Agree Fassbender’s performance was exceptional, but I was wish we knew why he was doing all those things. Very frustrating not knowing why.